no idea what she'll go for, as I'm clueless. Better get in before they all go. 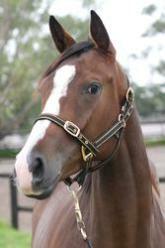 Lot 410 Denman - M'Lady Pedrille filly. Sire hasn't exactly set the stats on fire (as yet) but don't mind the female family at all. Happy with my lot , $54000 and a trainer I love Kelso Wood < I reckon my stubby holder stays on top of the fridge ! I will have lot 836 - No Nthn Dancer or Mr P! I like 2 lots out of this recent sale. Although it is a late entry, even if it is not accepted, at least would like to keep a record for myself, so that I can follow. Only just saw this thread. Is it OK to have a late entry with a lot I actually bought? Cool. Lot 837 Mossman - Pink Princess $24k. I also got lot 117 but will stick with this girl as my representative. I can almost taste those tim tams now. Well - if Lordy's allowed a late entry, I can only assume I'll be allowed in as well? A few more contestants will add a bit of spice! Mine is the half sister to one that I part-own! Love the pedigree when taken back 8 generations. She was a screamer on type!!! $150k - forget to mention the price …. Whoopsie who could forget poor old tassie? Bugger, missed this one. Can I please unofficially join the unofficial comp super-late if I make it a cheapy? Classic Sale. Lot 223, colt by Artie Schiller ex Mahira. Where's Fiddlestick's "facepalm" emoticon when you really need it? I've put together a spread sheet which Gay will post for us. Rosscoe's yearling is already named. I know it's very, very late, but would i be able to join in? Dizzy - Can I submit Lot 498 Foxwedge x Our Pride and Joy - $250,000 G Waterhouse. Thanks. Looks like my selection goes by the name of Cougar's Boy , nice to see em named early . Cougar's Boy it is goldey. I won't post the spread sheet until we have a few more named.